I’m so excited to share this recipe with you today! 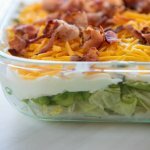 This 7 Layer Salad recipe is a family favorite of mine from growing up. My Mom has made this recipe for many years, and today, I’m sharing it with you! 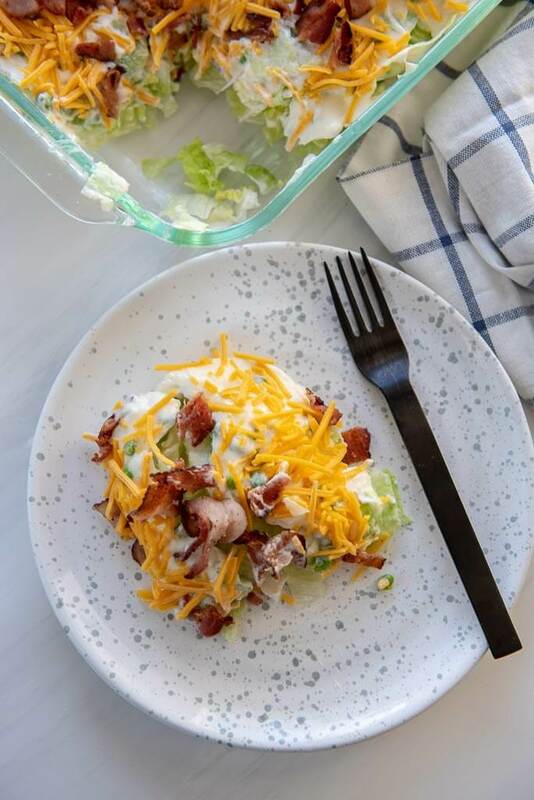 This 7 Layer Salad is simple to make and I promise, it will please a crowd! This past Christmas I was in charge of bringing a salad to my in-laws and I didn’t want to take a boring bag salad with dressing. I wanted to take something I thought they’d really enjoy so I called my Mom and asked her to share her recipe! 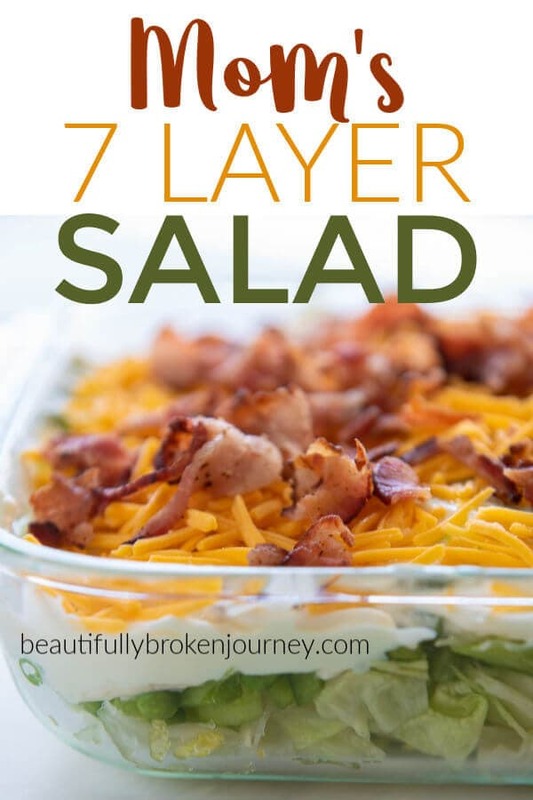 Thankfully, my in-laws enjoyed it and it rekindled my love of this 7 Layer Salad, too! My boys really like this salad as well and I’ve made it again since Christmas and they’ve gobbled it up! How do you make 7 layer salad? I promise it’s not complicated at all… in fact, you’ll never find an overly complicated recipe on my blog. I love simple, delicious recipes. You’ll start by cutting up the lettuce and cleaning it. 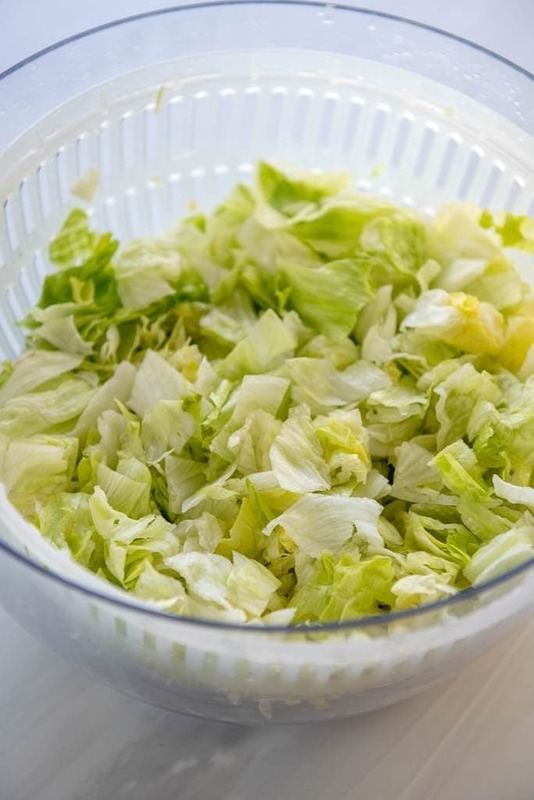 I love using a salad spinner to clean my lettuce. I cut up the lettuce, put it inside with a little water and let the spinner go to work. It works perfect every time! I believe family recipes should be shared. If they aren’t, we can’t continue to pass down those memories and traditions. I hope someday my kids will want to share their favorite recipe of mine that reminds them of their childhood. I have fond memories of many recipes of my Mom and my Grandma that I love to make for my own family! 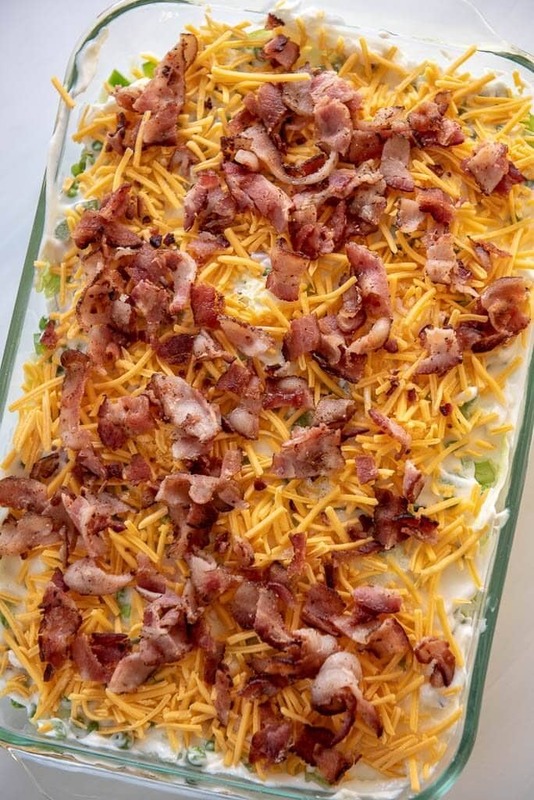 This 7 Layer Salad is great for social gatherings! Anywhere you are in charge of bringing veggies! On my Mom’s original recipe card she has written “Believe it or not this salad can be kept for about a week before the lettuce begins to wilt” So far, it hasn’t lasted a week at our house to test her theory because we eat it all in a few days! I hope you enjoy my Mom’s 7 Layer Salad as much as I have through the years. If you serve it, I’d love to hear how your friends and family enjoyed it! If you are looking for another salad recipe, check out my Southwest Chicken Salad as well! Or if you need a salad to take to a gathering my Honey Lime Fruit Salad is perfect! A family favorite recipe! 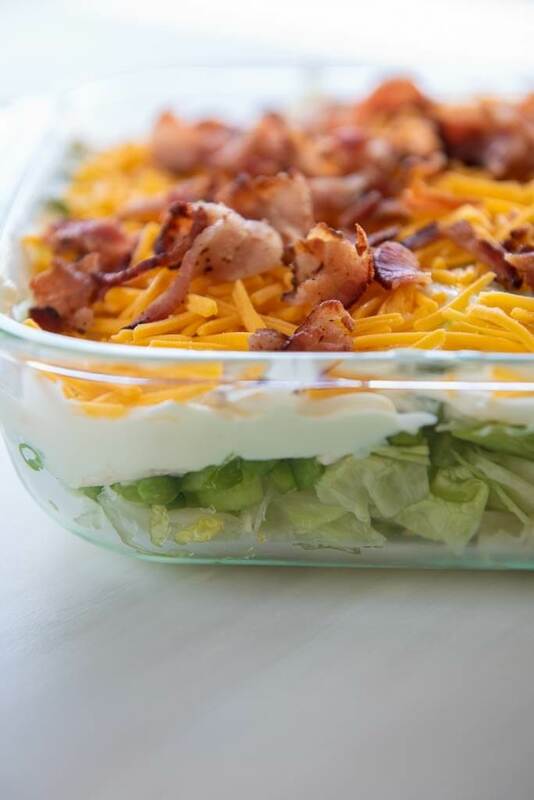 My Mom's 7 Layer Salad is perfect for a get together for a fresh and crisp side dish! Place chopped lettuce in a 9x13 pan. Cook bacon in skillet and allow to cool. 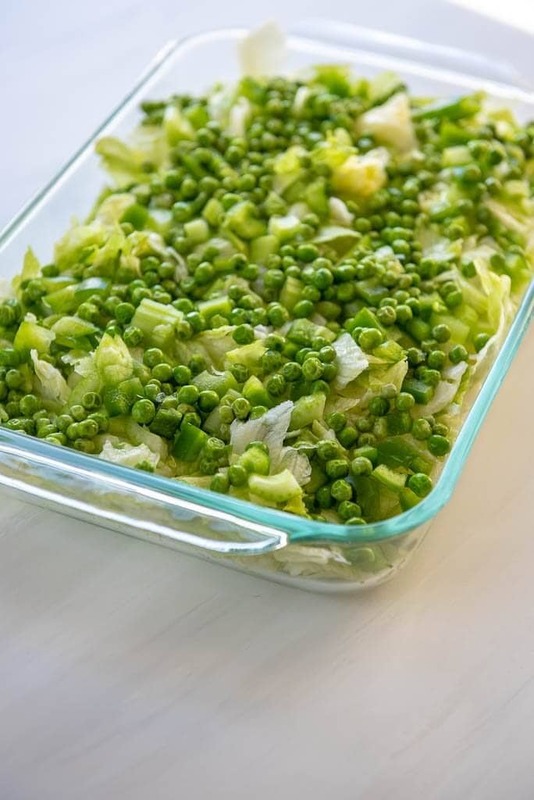 Chop all remaining vegetables and layer on top of lettuce in this order- celery, pepper, onion and peas. 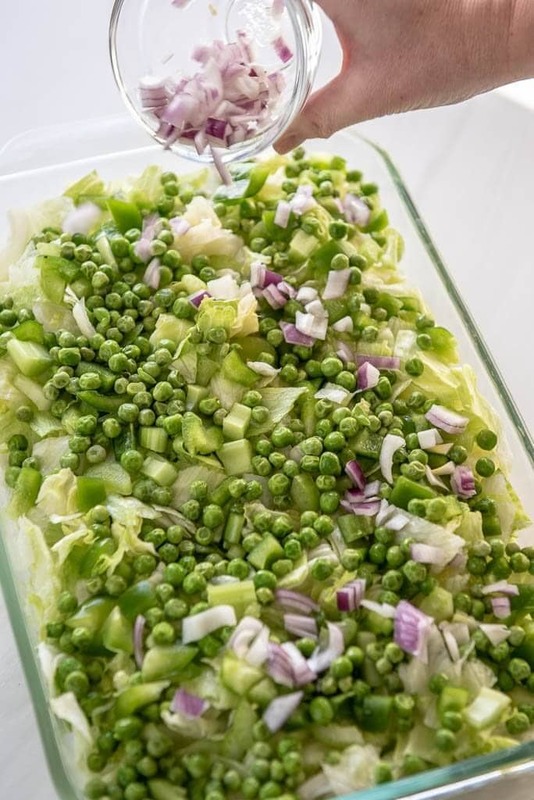 Spread mayonnaise on top of vegetables and sprinkle with sugar. Add shredded cheese and top with crumbled bacon. My Mom's recipe calls for 2 Tablespoons of sugar, I personally don't think it needs that much but you can add an additional tablespoon if you'd like.